At Ireland's Rustic Lodges, you'll be as close to nature as you can get without giving up the modern conveniences we all expect. Set back among gorgeous floral landscapes or facing the wild, windswept Gold Beach, choose from cozy cottages and cabins, many featuring knotty-pine paneling and wood burning fireplaces, or from spacious suites, condos and private beach homes, all featuring free WiFi, large flat panel TVs with premium cable, bay windows, mini kitchens, full size sofa beds, high quality mattress with triple sheeting and balconies and patios with ocean or garden views. 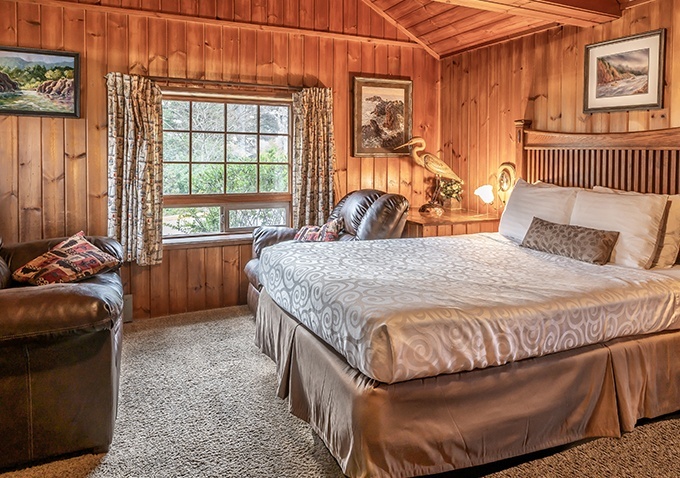 Make your Oregon coast vacation dreams come true with an affordable holiday at Gold Beach's Ireland's Rustic Lodges. Take a look at just some of what we offer and contact us to reserve your stay today. Start your Gold Beach vacation off right in this affordable and comfortable Standard Room that features one or two queen beds with triple sheeting, a mini refrigerator, microwave, coffee & tea maker, free high speed Wifi and local phone calls, flat screen TV, plus complimentary toiletries, a spacious bathroom, full size sofa bed and a balcony or patio. Take in the natural beauty of our Gold Beach landscape in this spacious Garden View room, featuring one or two queen beds with triple sheeting, garden views, mini kitchens, balconies or patios, free local calls and high-speed WiFi, daily Quiet housekeeping, hair dryer and complimentary toiletries, in-room safes and a sofa bed. 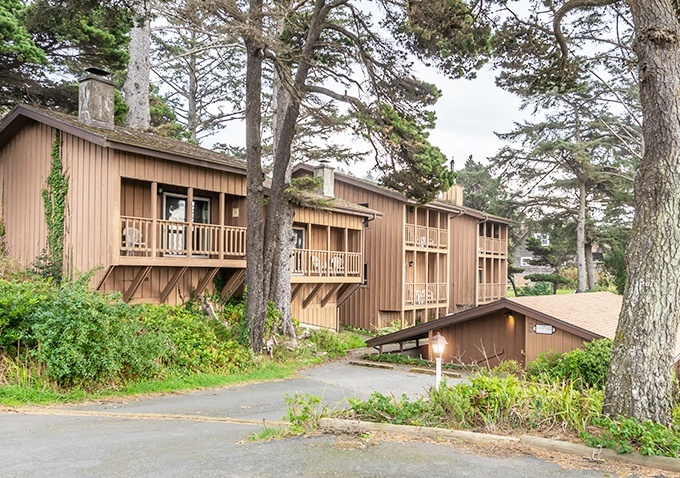 Enjoy breakfast in bed with unobstructed views of the Pacific in this Ocean Front Room that's as close to the water as you can get in Gold Beach. 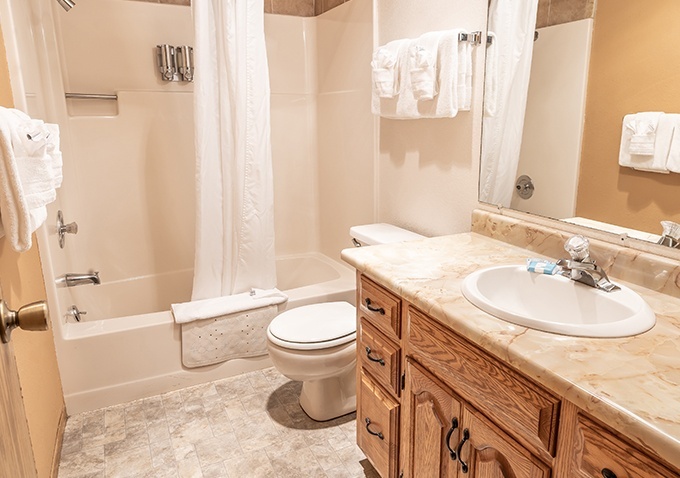 Featuring one or two queen beds with high-quality triple sheeting, a balcony or patio, mini fridge, microwave and a flat screen TV, plus free Wifi and complimentary toiletries in a well-appointed bath. Create your dream Gold Beach coastal vacation in an Ireland's Rustic Lodge Cottage that features one queen bed in an oversized room with garden, partial or full ocean views, cozy knotty pine decoration, wood burning fireplace, microwave, mini fridge, flat panel TV with premium cable, complimentary toiletries and free high speed internet and WiFi. 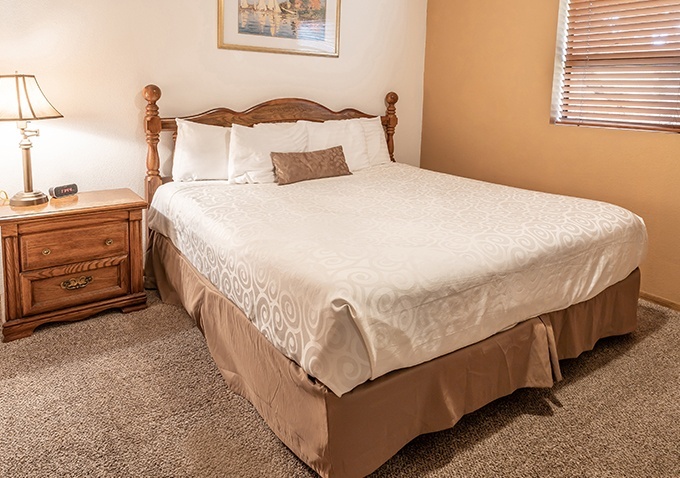 Get comfortable in our one or two bedroom Suites that have one king and one queen bed with triple sheeting and can sleep up to five guests with a full-size sofa bed. 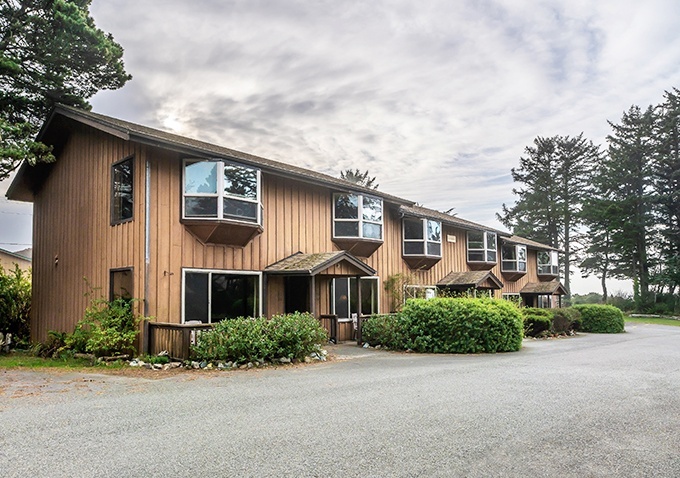 With premium oceanfront views, a balcony or patio, mini fridge, microwave and coffee maker, plus free Wifi, spacious separate bedrooms and living areas, you'll be vacationing in charming coastal style. 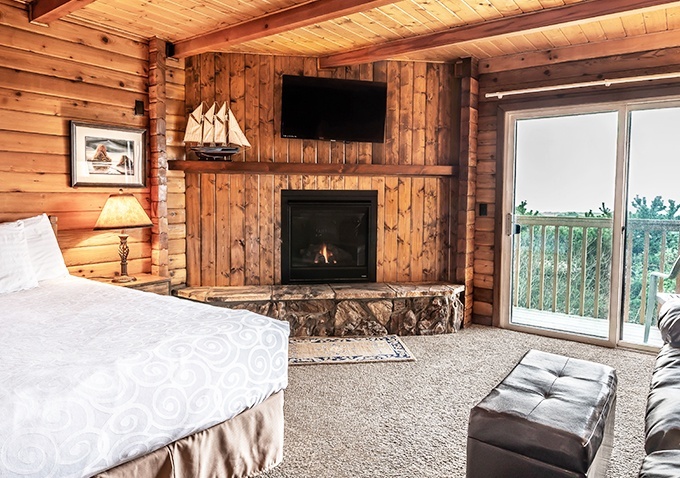 Perfect for family holidays, our Ireland's Rustic Lodges Condos offer truly charming coastal accommodations. Featuring two queens and one double or four queen beds, all with triple sheeting, plus full kitchens, balconies and patios, free WiFi, spacious baths, complimentary toiletries and private beach access, you'll be relaxing by the ocean in no time at all. 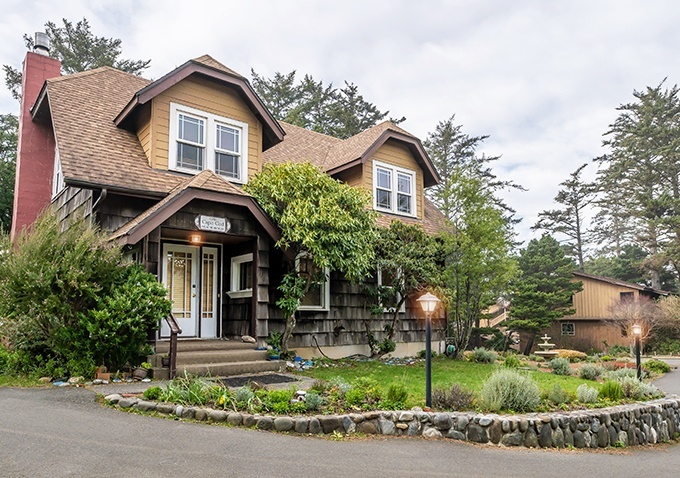 Book your family and friends holiday on Oregon's stunning southern coast in a two or three bedroom private Beach Home with an ocean view deck. Stylish yet affordable, they feature two queens and one double bed or three twins, two doubles and one queen or two twins and one queen bed, all with triple sheeting, patios, full kitchens and free WifFi.